With the new Resin Wicker outdoor furniture, why would you need a cover for it? If your furniture sits out in the sun, the sun will make the colors dull over a long period of time. If you cannot take your furniture inside some where for storage it will fade and eventually dry rot the cushions. The easiest way to protect your investment is to get a cover for each piece and use the cover any time you have long periods without using your furniture. We will look at examples for each style of outdoor wicker furniture. Each piece that you own will have a cover made just for it. This way it will not look like you just put a tarp over your furniture. Now lets look at your options. First measure the width, depth and height of your piece of furniture that you want to cover, as there are several different sizes of covers. After you have determined the size you must make up your mind the material for your chair cover. Choose between All Weather covers and Weather Resistant covers. The All Weather covers are ultra durable and made to be water repellent. They will not let the sun fade the fabric on your furniture. Cleaning of this soft polyester fabric material will be with a damp wash cloth. With sewn edges for durability it will have a stronger bond that pressed seams. The UV Resistant material will resist Mold, Stains and Fading even in the toughest conditions. This tough water repellent 2-ply polyester material is vented to help prevent mildew. It has handles to help with taking it off and elastic and ties to secure it to the furniture. This material will stand up to big swings in temperature and other weather conditions. There will be several styles of covers for your chairs. If you can stack your chairs four high the stacking chair, this cover will work for you. This is 24 inches long, 30 inches wide and 42 inches tall. Rocking chairs can benefit from a cove too. The cover is 27 inches long, 32 inches wide and 44 inches high. This should cover most of the high back rockers also. Table chairs with arms can be covered with the 26 inch long, 26 inches wide and 35 inches high cover. These are available in both styles. T he covers in this category will cover the table and chairs as one unit. You will not need to have 5 to seven different covers around when you are using your table and chairs. You can purchase in both styles. Because of the different sizes and number of chairs you will have to measure your set when it is not in use to get the correct one for you. The round tables will come with either two chairs for a bistro set or four for a full dining set. 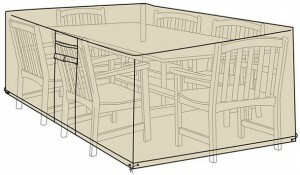 The number of chairs and size of the table will be what determines the size of the cover. A small bistro set will use a 43 inch diameter by 34 inch tall cover. As the table and set gets bigger larger sizes are available up to a 92 inch diameter by 34 inch tall unit. Your main seating may require a big cover. They are made in sizes from 64 inches long, 34 inches deep and 34 inches high to 76 inches long, 36 inches deeo and 32 inches high. 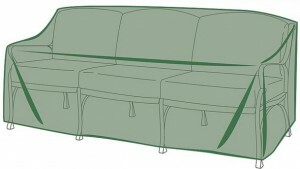 The smaller size will fit most love seats and the larger size will fit most sofas. Outfit your outdoors with easy-care wicker from Plow & Hearth! If you are looking to protect the big investment that you have made on your outside wicker furniture, these covers will be a great way to make your set look new for a long time. It does not take much time to protect your stuff and you will be happy with your investment for a long time. OH MY GOD finally someone that sees the importance of outdoor wicker furniture covers ! Many people tend to ignore this accessory but I for one don’t and it seems that you don’t either chris. I look forward to reading more of your articles as they are very unique and informative, nice job. 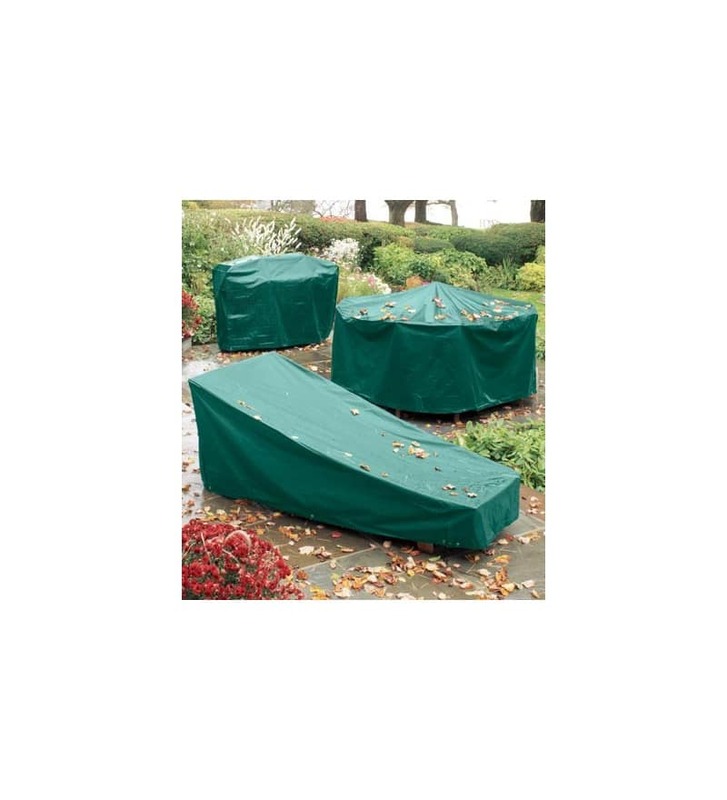 These covers will keep you from having to find storage for your Wicker Furniture when not in use. It will truly last a lifetime if protected from the sun and elements. Interesting post. While I am in favor of protecting my investments, the last thing I want to have to worry about is covering my furniture. However, you make some great points here. I guess I agree with you when it comes time to buy no furniture prematurely, haha! Keep up the good work! We have trouble with things blowing away when we get these heavy gust storms on occasion where I live. So covering everything seems like it would increase the ability for the wind to blow things all of the place easier. Do these allow for attaching to the ground or anchor them in some other way? We usually have to stack everything against the house or behind our trailer to help them stay put. But it’s such a pain and I’d rather not if some sort of a cover can help me do that. Both styles of covers come with tie straps on the bottom. You can use these to attach your furniture to something that is more permanent for security. Interesting article on wicker furniture covers. I live in Australia where people love the outdoors and so outdoor furniture is extremely popular because of the weather. I love wicker furniture as it very attractive, yet casual. The sun here is very harsh as you point out, the sun can dull the colours. Also of course during the winter, people are not outside so much. There is nothing worse than spoiling attractive furniture by making it look as if you have casually thrown a tarpaulin over it. Great product and practical review. As it is wintertime down under now, it is a great time to get some covers to protect your furniture for next summers use. The dining tables and chairs seems like a good idea, we are always having dinner outside at this time of year. The good thing about these covers is that you can use them for protection in the summer and storage in the winter. They do not have a bad style so they can sit out in your outdoor space and not look bad. I ended up on this article because I was actually looking for covers for a huge metallic BBQ we have out in the back garden. I know you are centering on outdoor furniture here but do you have any tips on these BBQ covers? Will the covers you’ve mentioned above do the trick or should I look for something more specific? I only covered the furniture, the vendor also has covers for several other items that will fit very nicely. Thanks for the info on the furniture covers – my chairs and table are sitting out in the elements and I’ve been thinking about getting covers for the end of the season. I will definitely check out the websites you have listed when making my purchase. What material do you feel is best for the southeast – heavy sun/rain and then temps near freezing in winter – maybe some snow/ice? Thanks. The water proof will work better in a wet environments. The snow and ice will not be a problem for either product. This is really interesting as I had no idea you could even get covers for these types of furniture. I am surprised they make so many different covers, and the prices are pretty good. Thanks for posting this and I simply love some of the furniture you have for sale. Most people don’t have any idea of what you can get for your outdoor space. This article reached me at the right time! I was just going to buy new outdoor furniture for my house. The previous one was not covered and therefore it spoilt in less than 2 yrs. I have many friends who are not aware of this product. I will definitely recommend your page to them too. Thanks for recommending my site to others. I will continue to add information that is useful to all that use their outdoor space. I like your site it is very informative. What made you come up with the idea for this site? I really like it and i learned a lot about wicker furniture covers. You will help a lot of people with there out door room ideas. I wish you all the luck with your site. Keep up the good work. I do think you need some more media just to break up the paragraphs, but that is just me. The reason for this site is that people are using their outdoor space more and more. I just wanted to give information on what is available for your outdoor space. Working on some videos that will help people understand on how to install and assemble some of these items. You are totally right about protecting your outdoor furniture. Most people should invest in some form of protection and your options are great for most people. I actually created a shed that we use as living space in the spring , summer and fall season and store our cushions when not in use. During the winter we pile every main thing in for storage until the next season. The really big items get covers as you mentioned. Items that are stored in a shed still need protection from some elements. A cover will make them last longer and look good. Hmm you make some good points. I keep a table and chairs, and a lounger chair on the back patio and have never covered them before. They’re pretty ruined looking now, with bugs all over them of course. I should’ve come across this sooner. Are there ‘spider repellent’ covers? Haha I wish. I wish there were spider and wasp resistant covers. These would make a big splash for the furniture covers. If you just apply the covers your patio furniture will last many more years. Very interesting article…thanks for writing this. I have some furniture like this and I had no idea my resin outdoor furniture could become discolored. I noticed that you feature both tan and green outdoor furniture covers. Are there more color options? Does color make a difference when choosing one of these things? There is a difference in the two colors. One is weather resistant and the other is all weather. The weather resistant will keep your furniture drier. 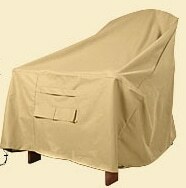 I have never thought of using outdoor furniture covers but after reading your web page it sounds like a good idea. Having the option to protects against wet weather and mildew is important to me because I live in a rainy city in the northwest. Covers for outdoor furniture will definitely keep my furniture dry. When not in use, it is a good idea to cover your patio furniture with something to prevent damage from the elements. Covered storage would be the ideal solution, most people cannot store their furniture under a roof. Hi you have the start of a really good site. Loved the background gives a feel for what the website is about. The theme works well for your chosen niche and liked the layout. Your writing style is very easy to read and understand. You have a good use of images that fit in well with your topics. I especially liked your page on lighting as I am trying to decide what type of lighting to use in my garden. You have helped me to decide thank you. Many times we go and have a project done only to find an easier or better way to finish it. Many types of lighting will work in your garden, you will have to decide on Low Voltage or Solar lighting before you are going to pick out the style. Nice post! Many people tend to ignore the importance of having covers for their outdoor furniture. Little do they know that making an investment in good quality covers saves money on buying new ones and also keeps them wonderfully looking. Weather resistant covers that help prevent mildew are especially good. This is one way to make you outdoor furniture last a lot longer. This will keep you from having to bring your furniture in the house or another storage area. Wicker stuff is cool. The comment from the 1989 Batman film came to mind for some reason. “King of the Wicker People”. A comment made in Bruce Wayne’s mansion by a newspaper reporting after viewing some of Mr. Wayne’s collectibles. Anyway, back to cool wicker stuff. These covers are quite nice and the customized shapes make them so much easier to use. I clicked on of the links and went to the Plow & Hearth store website. I’d never heard of Plow & Hearth. Looks like a promising operation. The Plow & Hearth has quite a selection on outdoor things. The covers for the wicker furniture covers are just one of the many things to protect your investments. Thanks for reading and looking at my post items.